Since 2003, FHM has sent Vacation Bible School teams to Haiti each summer to conduct a week-long VBS program for the children of Blanchard and Fondwa. Donations to Family Health Ministries help to provide Bibles in French/ Kreyol to Christian Community Church members and visitors. FHM partners with Pastor Leon Dorleans as he minister to the Christian Community Churches in the Port-au-Prince area. 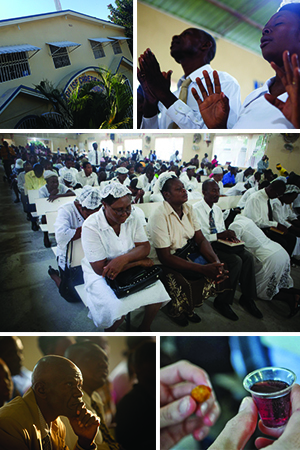 Family Health Ministries provides salary assistance for pastors in the Christian Community Church in Port-au-Prince. FHM provides Pastor Leon Dorleans with a donation each month to distribute to community members as he sees fit for food, shelter, and other critical necessities. These funds allows Pastor Leon to help those in extreme need who have no other resources. The vision of this advisory council is to bring together various local organizations, churches, and partners working in Haiti once a quarter.